Dallying In The Dirt, Issue #205--- Some old seeds are out and some new seeds are in. Seeds. 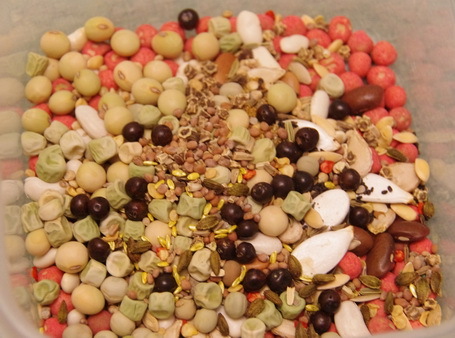 It’s all about seeds at this time of year. Some coming and some going out and many germinating. I am a few days late with this issue of Dallying for a variety of reasons and today is Family Day, a holiday in my little part of the world. It is also very cold, about - 23 C this morning and that’s cold on anyone’s thermometer. It is bright and sunny and sitting in the sun warmed solarium having breakfast I was surrounded by three types of Orchids and several Amaryllis in full bloom. On the other side of the glass was brilliant sunshine and sparkling white snow that looked very pretty from my vantage point. Back to the seeds, because they are the activity of the week and sitting in the sunshine admiring the many blooms was not getting anything planted. The first step in organizing the seeds for the year is to sort through the seed box and toss out any that are too old. My rule is to keep seeds for two years. Every package that comes into the house gets a date stamp and this past week anything that had a 2013 stamp was tossed out. I know that many of them would have germinated but often at lower rates and by the time you realize that something is not germinating it is often too late to order more and start over. Sometimes throwing out seeds gets rid of varieties that did not perform well and makes room for new ones. Being a diligent recycler I opened all of the packets and dumped the seeds into a bowl that eventually made it to the compost and the paper packets went into the recycle box. The bowl of discarded seed actually had one final use, it made the nice picture you see above. The same day that all of that tearing open and tossing was happening, the mailbox was filled with a nice fat package. The package came from All America Selections. I don’t usually write about a new variety until I have actually grown it but the awards from this association make these varieties ones that I have little hesitation in recommending. 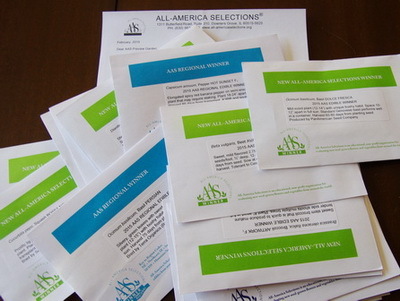 All America Selections has been doing country wide testing of new varieties since 1932 and many of their previous winners remain at the top of seed racks as people’s still favourite choices. Just recently they have started giving out regional winners to recognize varieties that were outstanding in some parts of North America but not in others. It seemed unfair that a new Tomato that everyone in the North East of the continent loved did not get recognized because it performed poorly in Texas. I have 25 new varieties to try this year and they may not all make it to the garden. I do have some space limitations, as we all do. There are some vegetables types that have never had an award that have an awarded variety this year, such Pak Choi Bopak, Brussels Sprouts Hestia and Oregano Cleopatra. They will most certainly be in my garden this year. Tomato Chef’s Choice Pink must be tried. There are so many Tomato varieties that a new winner in that class has to be something quite special. There are couple of hot Peppers that might find very limited space, maybe one or two in a container, where hot Peppers seem to do well. There are a few flowers, including a couple of Petunias, Tidal Wave Red Velour and Trilogy Red, that will be sure to try. Check out all these varieties and try ones that appeal to you. As you tear open your packages of seed and get ready to plant them, there are a few things to remember. Moisture and light are obvious to most people but the secret ingredient for seed starting success is often overlooked. Most seeds will germinate much more readily in warm soil. The air temperature matters, no seed is going to germinate outside at my place today but the soil temperature is critical. 23 - 26 C (75 - 80 F) is the optimal range to maximize the germination of most seeds. There are always exceptions and the easy way to find them is to read the detailed instructions on the seeds packages. Seed companies provide great instructions because they want you to be successful and come back again next year. 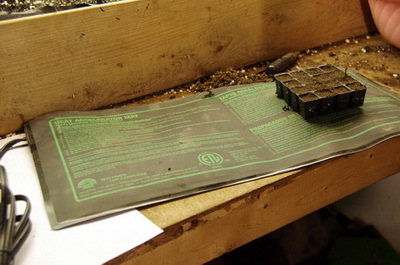 There are a variety of ways to warm up the soil and some such as the readily purchased heat mats are an economical and non-messy way for the small scale gardener. They are thermostatically controlled to warm your soil and seeds to the right temperature without cooking them. You can be creative about supplying the heat source but supplying it is a sure way to guarantee germination success. Claire Asks? I haven’t pruned my grape vines or fruit trees yet, is it too late or too early? Ken Answers! At -23 today, it is definitely not a good time to wander outside and start pruning. Late winter when it is a lovely sunny day and the temperature is tempting you to wander outside, is the perfect time to do this pruning. You must get it done before the buds break and the plants start growing. I’m usually out there on a sunny day in March.